In 2004 the throttle cable system for the R1100S, R1150GS/R and K1200RS/GT/LT was upgraded (R1150RS/RT and R1200C models were not affected*) using parts that had been developed to ease throttle effort on cruise-control equipped bikes. The change is retrofittable to all affected models, and in some cases the old cables are obsolete. 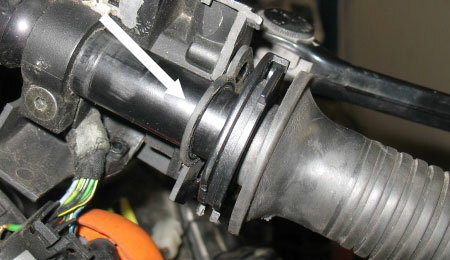 If you are replacing your throttle cables, you may want to verify that you have matching parts before you start work. There are actually two different styles of update. On the R1100S, R1150GS/R and K1200LT, the new design incorporates the 90° bend at the handgrip into the cable itself, whereas the old design turned the cable within the throttle housing. On the K1200RS/GT, the cables have an extended inner sheathing that curves within a deflector similar to the existing one. The photos will make this clear. Old cable design. Straight cable end (not shown) enters the throttle horizontally, with a curved deflector in the throttle housing. 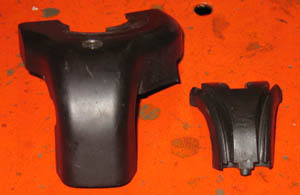 The old deflection parts are removed (three of them) and the two new parts replace them. If you have the new cable with the bend, you need the new style deflector. 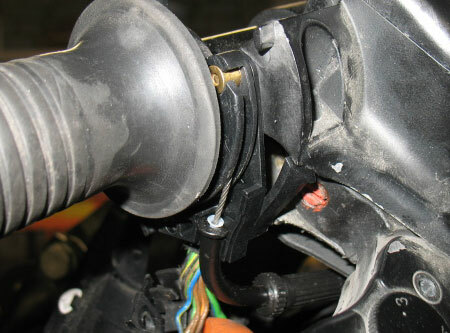 Removing the throttle grip is not required, which is a great help if you have heated grips. The innermost part of the old deflector wraps around the handlebar but can be cut off. 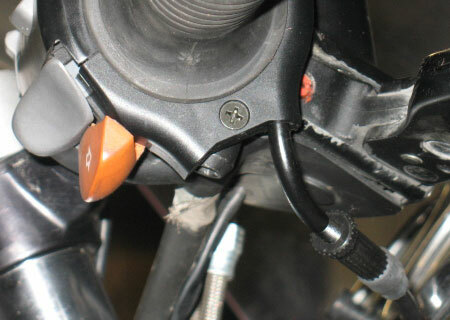 The replacement parts do not encircle the handlebar, so they can simply be inserted. 1. 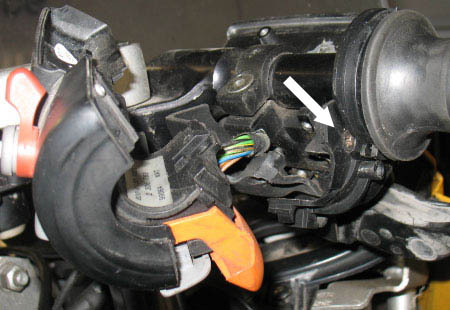 Remove the old deflector cover, disconnect the cable and pull the curved cable guide downward. These are two of the three parts you need to remove. 2. 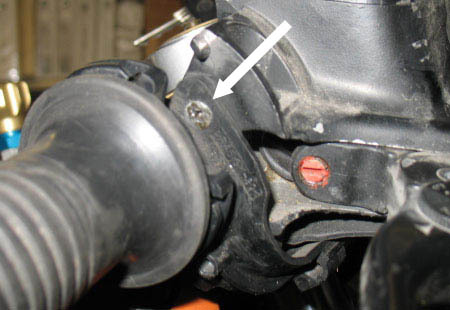 The third part to remove is held to the throttle housing by two screws: one at the bottom rear and one at the top front. You'll need to pull the switch assembly off and then slide the grip outward slightly to access both, so do that first. To disengage the throttle tube, you'll have to roll the throttle all the way forward and then pull it away. 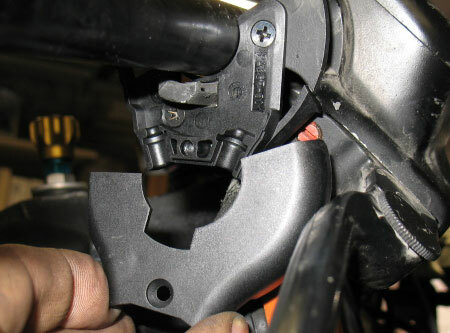 You will probably have to loosen the housing clamp and rock the housing back in order to get enough movement, especially with heated grips. Be careful that the heated grip wires don't catch on the support for the bar-end weight! Removing the switch gives access to the lower rear screw. With the throttle tube pulled back, you can access the front screw. This tang holds the throttle tube in. You have to turn the throttle forward and rock the housing backward until it lines up with an opening in the throttle tube. Once the inner plate is loose, cut through the plastic strap to remove it. 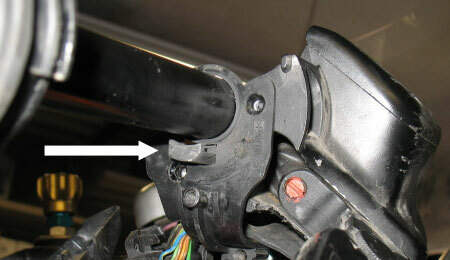 3) Once these screws are removed the inner part of the deflector will be loose. Simply cut through the strap at the top and pull the part off the handlebar. 4) Install the new inner part, reinstall the throttle tube, position the new cable and install the cover. With the new inner deflector (really just a cable holder now) installed, you can see how the end of the new cable will be held in place. Re-engage the throttle tube onto the tang and install the new cable. 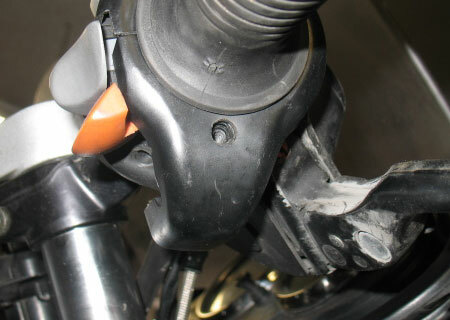 The rear cable holder is used on bikes with cruise control, which have dual throttle cables. 5) Adjust the housing to the desired angle, tighten the clamp. It only needs enough torque to keep it from turning under typical hand pressure; probably 6 Nm or less. Reinstall the switch assembly. Install the bar-end weight (20 Nm) and mirror (15 Nm), if so equipped. 6) Set the throttle cable to about 1mm of free play using the threaded adjuster at the curved section. If you're working on a Boxer, proceed with the cable adjustments at the throttle bodies (you did replace the lower cables also, right?). * Although the R1150RT was never affected, the upgraded cable from the R1150GS is said to work well. Our thanks to Ferdinando Bernasconi for discovering this for us. The kit consists of a revised deflector 32 72 7 682 288 with wider grooves to accomodate the extended cable inner sheathing.